Tree fungal infections are not only unsightly, they are damaging, if not deadly, to your tree. Under the right conditions, most trees are susceptible to fungal diseases and can be easily overwhelmed when they are stressed by poor maintenance and drought conditions. Unlike fungal foliage diseases that attack the foliage, stems, flowers and fruit of the tree, tree fungal diseases attack the trunk and base of the tree and can usually result in severe infections. There are hundreds of fungal disease variations. Depending on the variation, the disease may be soil-borne, water-borne or air-borne. In most cases, fungal disease require cool, damp environments to incubate, windy and rainy conditions to travel and infect the tree, and hot, dry conditions to spread infection throughout the tree. In most cases, the natural season changes from spring to summer provide ideal conditions for these diseases. The type of fungal disease dictates how the disease will enter the tree. While water and air-borne fungal diseases enter trees through natural and man-made wounds, soil-borne diseases enter the hosts through the root systems. Most tree fungal diseases infect trees from the inside out. This pattern of infection often results in delayed symptoms. In essence, the trees show signs of infection only after the infection has begun to deteriorate the tree. Although symptoms vary by disease, common tree symptoms include growth stunt, twig and branch dieback, foliage discoloration and wilt. 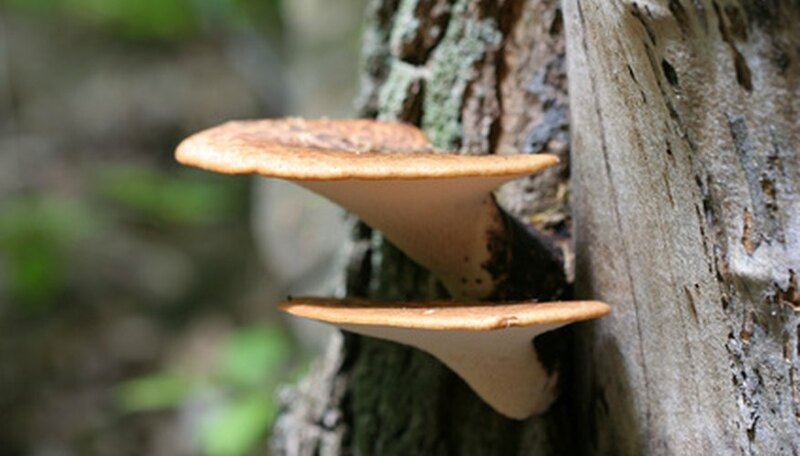 As these diseases progress, the infected trees will develop fungal growths, such as mushrooms and conks. These growths appear at and around the base of trees, near wounds on branches and stems, and on the bark of trees. The presence of fungal growths is a clear sign that the infected trees are decaying. A cross section of the infected area will show decay, discoloration, fruiting fungal bodies and fungal mycelia, depending on the fungus that has infected the tree. Tree fungal diseases are often referred to as rot diseases because of their rotting and decomposing characteristics. The diseases are often categorized into white rots and brown rots. White rot diseases include Armillaria root rot, Gonoderma rot. White rot diseases cause the wood of infected trees to become soft and moist, and the rots are often centralized near the point of entry. Brown rot diseases include sulfur fungus disease and phytophthora root rot. These diseases infect and decay living trees, as well as dead trees and stumps, and can often thrive for long periods without a host. The University of California explains that brown rot infections are generally more severe than white rot diseases. Fungal tree infections cannot be cured after the tree has been overwhelmed. However, in many cases, fungal tree diseases can be prevented and controlled. Since these spore-borne diseases thrive on decomposing matter, keep your tree’s area free of debris. This will reduce the potential of infection by eliminating the ideal environments for fungal germination. Keep pruning cuts and other natural and man-made wounds to a minimum. This will prevent the invasion of fungal infections through those wounds. Keep your tree vigorous since healthy trees are better able to fight off infection. Chemical fungicidal treatments can prevent and control tree fungal infections. However, for the treatments to be effective, they must be applied in a timely fashion. Apply the first application at, or just before, the onset of the growing season. Make additional applications according to the demands of the tree, the infection and the chemicals. Seek the advice of a nursery or horticultural specialist for assistance.